Will you know it when you see it at the grocery store? A conventional apple vs. the Arctic Apple on the right.Okanagan Specialty Fruits Inc. The Arctic Golden apple, the first genetically modified apple available to consumers, is making its way to grocery store shelves. I’m an apple loyalist—I pack one as an after-lunch snack nearly every day of the week. So I jumped at the chance to sample this new version of the fruit at a fall event hosted by the environmental technology think tank the Breakthrough Institute in San Francisco. The apple was crisp and mildly sweet, and pretty much tasted to me like any normal Golden Delicious apple. But there was one difference: When I let a slice sit on my plate for half an hour, it never turned brown. The apple is the handiwork of Okanagan Specialty Fruits Inc., a company based in Canada with orchards in Washington. Since receiving approval from the US Department of Agriculture in 2015, the company has been finessing several genetically engineered apples: The Arctic Golden has arrived at select grocery stores around the Midwest (though Okanagan wouldn’t specify which stores), and the Arctic Granny and the Arctic Fuji are in the works. Okanagan achieves this non-browning effect through a process called gene silencing. After creating apple genes that produce less polyphenol oxidase (PPO), the enzyme that causes browning, scientists grow small plantlets in a lab until they can be micro-grafted to apple trees and planted in an orchard. The resulting fruit has flesh that doesn’t turn a muddy color when exposed to oxygen. The Arctic’s non-browning properties mean it can be sold pre-sliced, which the company says makes it more appealing as a snack food for kids. Why go through all this trouble to change the color of the fruit? The Arctic’s non-browning properties mean it can be sold pre-sliced, which the company says makes it more appealing as a snack food for kids. And unlike other prepackaged apple slices, “our non-browning sliced apples are preservative free, avoiding negative flavor and aroma impacts of anti-browning treatments,” Okanagan President Neal Carter told me. And if the apples stay white, we’re less likely to toss them out, according to the Breakthrough Institute, which is helping promote the fruit: “By eliminating superficial bruising and browning, the Arctic Apple holds the potential to dramatically reduce consumer food waste once it enters the market.” Food makes up the largest share of waste at municipal landfills, according to the Environmental Protection Agency. Around the world, almost half of all fruits and vegetables are wasted every year, according to the Food and Agriculture Organization, and that includes a startling 3.7 trillion apples. But if the point of the apple is to help reduce food waste, why market it in a way that requires so much packaging? I asked the company, and it responded that the plastic bags are recyclable, as are the shipping cartons and trays. Still, it’s hard to see how whole apples would require as much plastic, recyclable or not. Some scientists see a different benefit: The Arctic apples might help familiarize consumers with genetically modified foods. In a Pew Research study from 2015, 57 percent of respondents said they believed GM foods unsafe to eat, compared to just 11 percent of scientists. Of course, we’ve had GM foods in our diets for years now. Bt-corn, for instance, has genetic material added to its seeds to protect the crop from pests like caterpillars. The FDA considers Bt-corn equivalent to non-GMO corn and it’s used in many products like tortilla chips and most high-fructose corn syrups. If you come across a packet of Arctic apple slices in stores, it won’t say “GM” on the label. That’s only if they know what they’re eating. A law signed in 2016 by President Barack Obama requires companies to reveal whether a product is genetically modified, but it does not force them to print that information on its packaging. 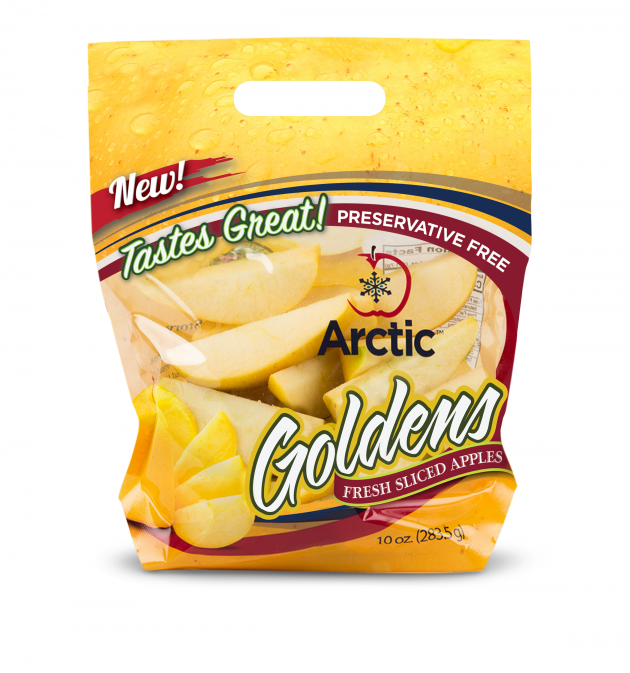 If you come across a packet of Arctic apple slices in stores, it won’t say “GM” on the label. Instead, there will be a QR code on the back that you can scan with a smartphone to learn more about Okanagan and the biotechnology at work. Which means many shoppers will probably buy the Arctic apple without any idea that it’s genetically modified, something that Dana Perls, senior food and technology campaigner for Friends of the Earth, finds disturbing. Perls argues that the effects of eating gene-silenced fruit have not been investigated thoroughly enough. “The Food and Drug Administration and the USDA are not prepared and have not caught up with current genetic engineering technology,” she says. Perls points out that there are already non-browning apples out there that don’t require genetic modification. Breeders crossed the Golden and the Topaz apples to create the Opal, an apple that naturally has a lower amount of the PPO enzyme and is often sold pre-sliced as a result. But while 14-ounce bags of pre-sliced Opal apples sell for $3.99 at my local Safeway (Okanagan says the Arctic apples’ prices “are not dramatically different from other sliced apple products”), I can buy regular Golden Delicious apples for $1.99 a pound. So, for now, I plan to stick with my daily snack of a whole apple—bruises and all.